I'm starting to recover from my bronchitis. This bronchitis is becoming a regular occurrence. I'm going to need to do some research to figure out why I seem to be getting this about twice a year now. It eats up a good two weeks or more each time. Anyone else have this problem? I've been sitting by the fire reading and knitting and watching movies for a good week now. Not such a bad time actually. We celebrated a very low-key Christmas, with ham sandwiches and cookies sent by my brother in Hawaii. I've read three books. 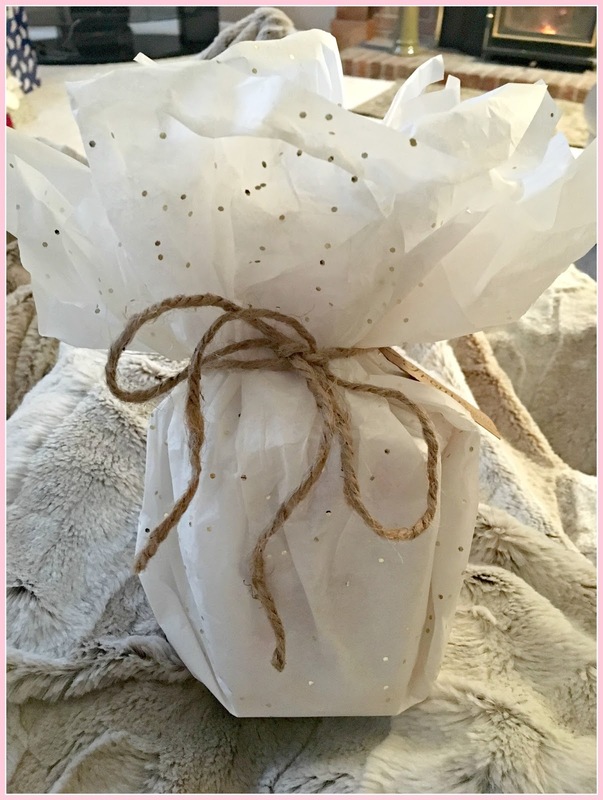 And, despite the fact that I was whining that I wouldn't have any gifts to open because we weren't going to be able to visit family, and my husband and I had agreed not to exchange gifts, there were gifts. My husband cheated, and got me some, and our daughter and son-in-law stopped by with presents and a nice visit. As you can see from the above photo, I didn't move from my chair all week! The coughing is starting to subside, so today I took care of a few things. I boxed up all the gifts for our sons and DIL, and my husband took them to the post office. I vacuumed and dusted and swept and did some laundry. Sheets need to be washed, groceries need to be bought, and bathrooms need to be cleaned, but . . . they always do, don't they? Are you thinking about the new year? This quiet week between Christmas and New Year's is a perfect time for contemplation and planning. And even if I wasn't sick, I'd be staying pretty close to home this week anyway. We've had about eight inches of snow, and the temps have been in the single digits. I don't like to think about resolutions. The word "resolution" sounds so grim and determined. And kind of like "will worship," as St. Paul describes it. I like to think of possibilities and dreams and goals, and see those words with little sparkles shooting out of them. Here are some of my ideas, still fermenting, still bubbling in the pot. *** Making Sundays device free. Here is a good article on this from a favorite website. Maybe. 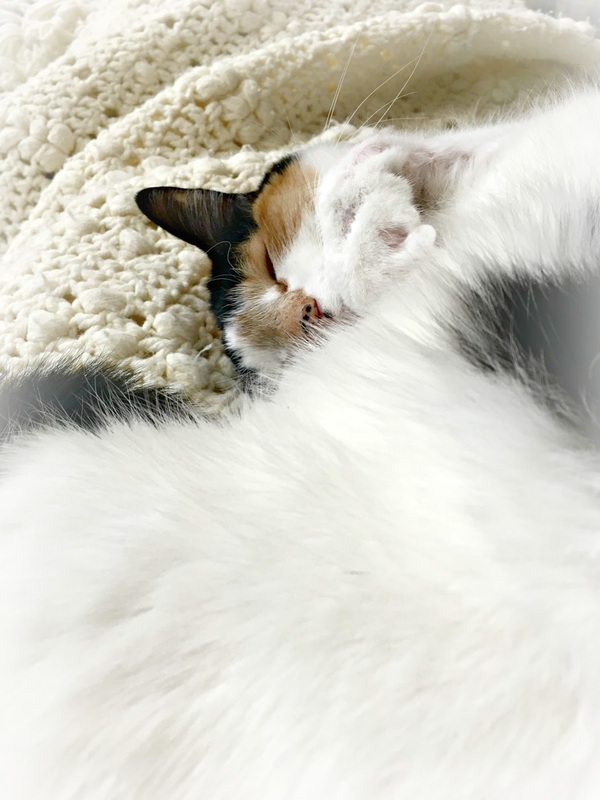 I do need to figure out how to corral the online time into a set part of the day so it doesn't invade my life all day, every day, as it often seems to do. *** Writing another nonfiction book and dusting off my fiction book. 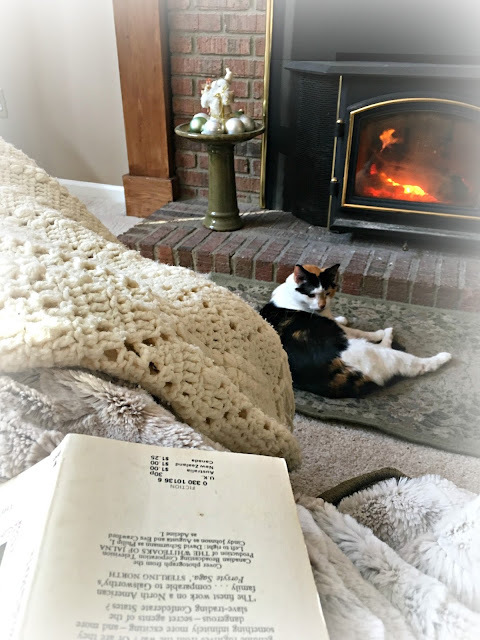 *** Learning to knit a sweater and finishing two afghans. *** Reading through morning and evening prayer from The Book of Common Prayer. I'm not Anglican, but was brought up one and miss the rich liturgical prayer book. I'll use the old 1928 version. You know, because older is better. *** Sorting through all the paper work in the basement. I still have boxes of old homeschooling papers and lots of photos to sort. This seems monumental to me. But sometime in the next five or ten years we will be downsizing and the time will pass quickly. Setting the timer for an hour and going at it regularly will make things so much easier later. *** Visiting our children. In just the few short years since they've left home, our children have worked in Montgomery, Alabama; Winston-Salem, Jacksonville, and New Bern, North Carolina; and Richmond, Virginia. Now our youngest is moving to Des Moines. I've never been to Iowa. Far from being in the middle of a cornfield, Des Moines is supposed to be an up and coming city. I'll let you know. I'm still dreaming, still thinking of different ideas. How about you? Any hopes and dreams for 2018? So glad that you are finally feeling better. Not sure what to say about bronchitis twice a year. I take echinacea from September to May and extra on shopping days and times of gathering with people...think germaphobe. 😏 I also have essential oils and Thieves on hand always. Happy New Year! You have lots of things on the docket. It's good to hear that you are some better. Having that down time can always be for the good, though it may not seem like it at the time. I like your idea of setting the timer for an hour to purge and downsize, going at it all day can be overwhelming. I'm not one for resolutions either, I like to set goals, realistic ones. My husband suffers with bronchitis too and working with saw dust doesn't help. When he startes taking thieves essential oils the instant he feels something coming on it has helped tremendously, but, he has to take them immediately and continue until he is no longer ill. This may not sound very nice, but he believes hacking up phlegm is key. He says you gotta get it out. :) I hope that helps. Oh, you make me feel your cold, in the single digits - oh my! As many times i've had a bronchitis, it almost always got coupled with cold weather. Working one January in North Dakota for one week at minus 40, did me in for weeks on end... I vowed to never ever going to such a place; not even for a million and I mean it. Living in Pennsylvania also had me sit bundled up in the living room, studying Italian for our next job... It was cold there. Do you have a de-humidifier in your home? Doing away with a humid environment helps a lot. Dressing well and using a silk or cotton camisole is a must for winter time. Just that extra layer, a buffer zone for absorbing any climatic changes your body has to cope with. Breathing clean air at home, replacing the airconditioning filters in time, having your car's filters changed in time. Eating some hot soup is good for keeping your system happy and warming you inside. A good balance of body - mind - spirit and eating plenty of fresh fruits and veggies with plenty of rest. Taking vitamins as a supplement also boosts your immune system. Don't know what miracle thing there is for totally avoiding it?! But I must say that I do steer clear of those bouts of bronchitis over the past couple of years. Wishing you a speedy recovery and oh my, resting comes with a hefty price tag once the days arrive where we have to play catch up on EVERYTHING! But that is life, isn't it?! We all are facing the same and it sure is not a fairy tale for maneuvering through the year. I am so glad you are feeling better, long may that last. Working towards down sizing is such a good idea, it took weeks for us to sort out our old home prior to moving. e are still working on some things after the move, Christmas decor been one. All the colour in my hair has now completely grown out and it is all my natural colour, a mixture of greys. I thank you for giving me the courage. Wishing you and yours everything you wish for yourself for the Ne Year. Dear Deborah ~ I am so glad you are starting to feel better & may you grow stronger and healthier with each new day. Making Sunday be a 'quiet' day sounds great to me. I want to cut my computer time way back in 2018. It does cause me to waste a LOT of time, and I've things I want to get done around here, especially before summer's heat and humidity come back. Glad you're feeling somewhat better, Deborah. And yes, I have a sister, sister-in-law and girlfriend who seem to get bronchitis 2x year. I can see how exhausting it can be. 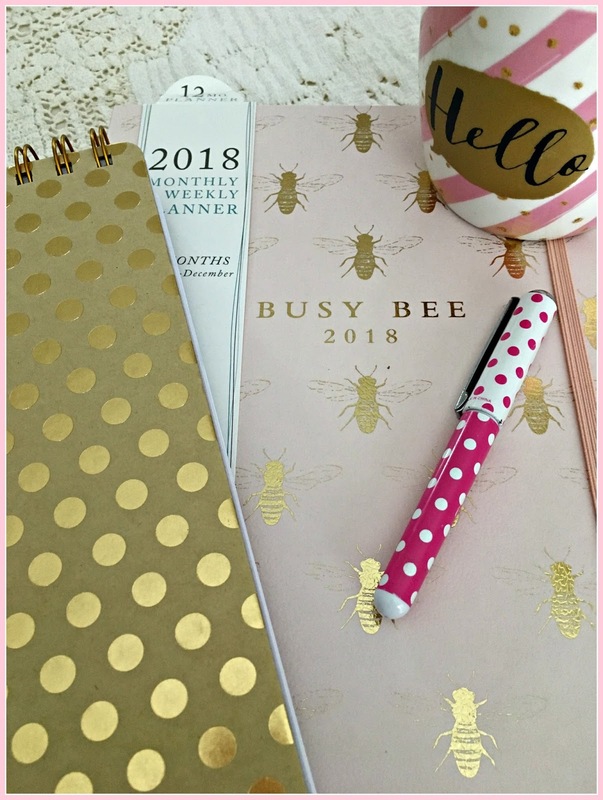 I love your busy bee planner! I also like the idea of setting a timer for going through paperwork - like bathrooms needing cleaned, it's a universal, first-world problem. Cheers to working toward your goals in 2018! I am so sorry you have recurring bronchitis, Deborah. That is so draining...and the coughing seems to last long past the worst of the bronchitis. I have only had it once but it turned into pneumonia and that was awful. 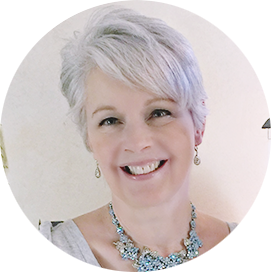 Dear Deborah, I'm so sorry you've been dealing with bronchitis~I used to get it a lot and it was always caused by allergies-which started the infection. I take several supplements when I'm around those with colds. I also swear by putting Vicks vapor rub on the soles of my feet at bedtime and wearing socks(so you don't ruin your sheets). My two daughters who have large families shared this with me years ago. It works to help stop the horrendous coughing. Also I grew up using Vicks on my chest and back, due to the severe problems I would have. Also a humidifier helps. I love your thoughts and goals on the New Year. I don't do resolutions either, but try to set some goals. Getting stronger and healthier is one of mine for this year. Blessings to you today. Praying you are well soon.. I'm glad that your bronchitis is starting to subside, Deborah, and you even have energy for some household chores. I received your book and hope to be reading that soon. My poor little mom fell and broke her right shoulder, so I'll be heading to Ohio to help with her care. Deborah, I'm trying to implement a bit more routine into my day. I stopped working in June, and since then I've let myself wander through the days, doing what I prefer. I want a loose schedule, not rigid, but enough to keep me on task with writing, painting, yarn work. Designate general periods of the day for certain things. Just stopping by to wish you a beautiful and blessed 2018. Wishing you a speedy recovery dear friend. Please get checked out. I have a brother that lives in Des Moines and it is a wonderful place. Clean, clean and neat, neat! Glad you are feeling better and hope you will soon be 100%. Blessings for the new year! Happy New Year, Deborah! Glad to hear that the R & R worked and that you're feeling better. Limiting my social media time is also one of my 2018 goals. I got sucked into Twitter last fall (for work though) and I just joined Instagram (to follow bloggers who have switched over to Instagram). Your book was delivered the other day!!! I was so excited that I bundled up and ventured out in -20C snowy weather in order to pick up the book from the community mailbox located down the street. Deborah, sorry to hear about the bronchitis. Not fun. When I was growing up I got bronchitis twice a year, and it lasted about 6 months each time! Turns out it was my parents' heavy smoking that caused it. Once I had been out of their home for a few years, it cleared up. I still get it, but not even once a year. Think it's been about four years now since the last episode. Wishing you a healthy and happy 2018. I'm glad you're feeling better. Take your time getting really well! I like your thoughts about 2018. We are starting a slow clean out so we will be ready when it's time to downsize. But I think it will be a slow process as we are not yet retired and there is so much to do each day! But still, a goal! Anyway, thank you as always, for your beautiful comment on my blog. I did reply to it. Do you get those reply's when I do that??? You always say the sweetest things and I appreciate your heartfelt words of kindness. And I look forward to seeing that knitted sweater! You can do it! It's really quite easy... I promise. I had a similar cold around the same time as you. I went through 1 1/2 big boxes of Kleenex and coughing fits on a regular basis. I'm so sorry that you've been sick especially over Christmas. I haven't been around blogland too much lately but wanted to wish you all the best in 2018! Hope you're feeling better each day. 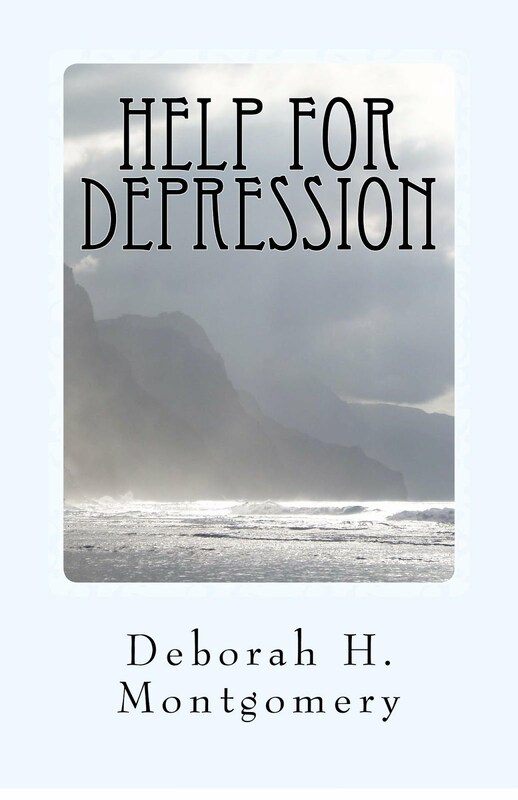 ...I saw the book about depression on your blog but was wondering if you have written any others. I will be entering the giveaway! I had bronchitis forever, then developed adult asthma about 18 years ago. Dampness, mould, and going from warm to very cold eg warm house, then going outside where it is icy, these were my enemies for bronchitis. The asthma is brought on by mould, can be allergy-induced, emotional, damp. So they overlapped for me. But things have gotten better over the years. Unless one has lived with breathing difficulties, it is impossible to understand how debilitating and exhausting it is. I practice gentle yoga which helps, plus have pressure point treatments (similar to acupuncture and shiatsu).